State game wardens are trying to track down whoever is responsible for killing four Roosevelt elk near the town of Arcata in Humboldt County. The California Department of Fish and Wildlife says that on Dec. 9, game wardens found four female elk, including one that was pregnant, that had been shot with firearms near the community of Blue Lake, about 5 miles east of Arcata. It's at least the second time this fall that animals from North Coast Roosevelt elk herds have been killed by poachers. In October, Fish and Wildlife and the National Park Service asked for help in finding those responsible for killing an elk bull in Redwood National Park with a bow and arrow. So far, that crime has gone unsolved. Before white settlement of the West Coast, Roosevelt elk once were found from southwestern British Columbia all the way south to Sonoma County. About 500,000 elk -- including the more familiar tule elk -- were found in what is now California. But like many other native species devastated in the wake of the Gold Rush, Roosevelt elk were pushed to near extinction by hunting and destruction of habitat. By 1925, just 15 of the large mammals remained in California. Protections imposed since then have allowed the Roosevelt elk herd to recover somewhat, and the state now estimates it at 5,700 -- all in Humboldt, Del Norte and western Siskiyou counties. The Fish and Wildlife press release on the latest poaching incident notes that some elk killing is legal: Each year, the department issues more than 300 elk tags -- licenses that permit the taking of a single animal -- for hunts throughout the state. The tags cost $459.25 for California residents, and $1,404.55 for hunters from outside California. Fish and Wildlife notes that the licenses are limited and the demand is great enough -- more than 33,000 people apply each year for an elk tag -- that "some hunters wait more than a decade to be successful in the drawing." 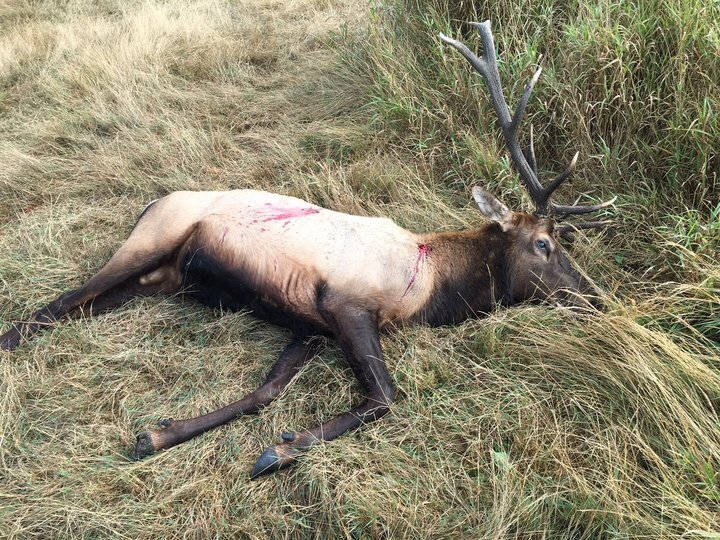 Elk hunting season was not open at the time the four Humboldt County elk cows were shot. Fish and Wildlife is asking anyone with information on the poaching incident to contact the statewide tip hotline, CalTIP, (Californians Turn In Poachers and Polluters), a confidential secret witness program. The number: 1 (888) 334-2258. Tips can also be sent via text to "CALTIP," followed by a space and the message to tip411 (847411).